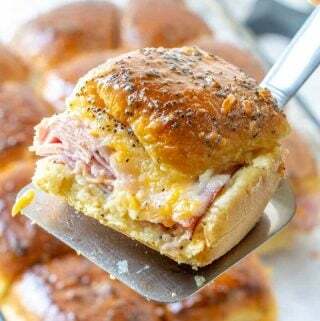 Slice your Hawaiian rolls in half, and place bottom half in an 11"x7" baking dish, set aside. In saucepan on stove melt together butter, minced onion, dijon mustard, brown sugar, Worcestershire sauce and poppy seeds. Using a pastry brush, brush a nice thick layer onto the bottom half of rolls in pan. Next layer with your ham, we like to shingle the ham so it gets nice and even, then top with your shredded cheese. Place top layer of buns on top and then brush with more of the butter mixture. Bake in oven for 10 minutes and then brush with more of your butter sauce and bake again for 10 minutes longer. Remove from oven and brush with again more of the butter sauce.